Radhika Khimji, Stay Safe, 2016, parachute, canvas, ropes, and metal eyelets, 30' diameter. Radhika Khimji’s installation Stay Safe, 2016, takes your breath away—not for its sheer beauty but for the compassionate plea that it silently screams. There is something tragic about this abandoned, neglected parachute. Thrown across a wall of the sixteenth-century El Badi Palace, this white symbol of a descent here looks almost accidental. And yet the piece also suggests an arrival while hinting at shelter or escape. Isn’t a parachute meant to land in a safe spot? White is the shroud that covers the dead; how helpless we appear in the face of conflicts that necessitate such wrappings. Though Khimji’s work looks at rest on these terra-cotta-colored walls, there is an air of painful solitude about it. It’s displayed in relative proximity to a veritable playground of monumental works, but its isolation feels deliberate. Moving on to the array of sculptures close by, Stay Safe is forgotten—why would we want to ponder the state of something neglected, anyway? 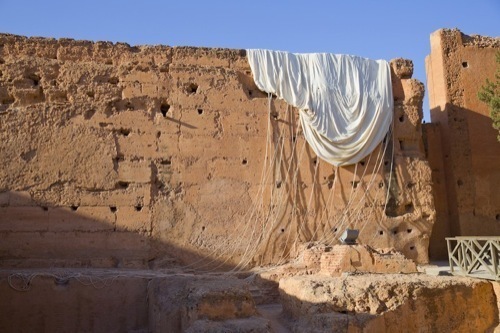 A further exploration of the Marrakech Biennale reveals another edition of that installation, this time in the city’s Koutoubia Mosque—a locale with an even heavier gravitas than the first. Here, the parachute lands in a place of worship—perhaps a comment on people’s instinctual flight to safety in a crisis. Is there a relationship between history and a contemporary gesture? More than anything, however, Stay Safe is emblematic of a terrible vulnerability. Be careful where you fall.